Tattoo Blog » Chad Stone, Taking the Highroad. 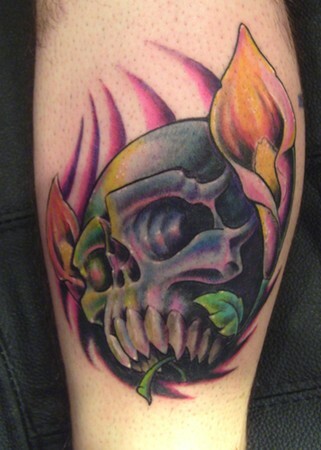 Tattoo Blog » Stories » Chad Stone, Taking the Highroad. Chad Stone, Taking the Highroad. For the majority of people in the know on the East Coast, when you talk new school tattoos your talking Chad Stone. 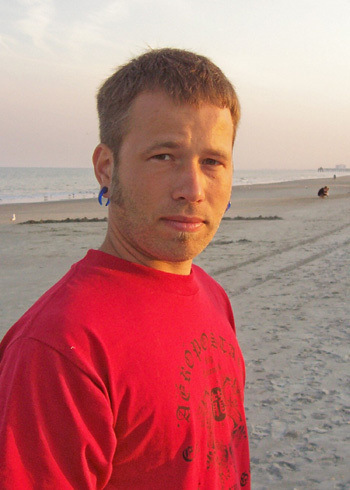 A native Mighigander, and avid surfer, (bet ya didn’t know they surf in Michigan), Chad is a super all around artist, and a master tattoo artist. Currently working out of Hart & Huntington studio in Orlando, FL. Chad divides his time between his art, surfing, and a variety of interests that would seem to take up far more hours than there are in a day. The man likes to keep busy. A passionate artist Chad ran into the same old brick wall that so many artists with a powerful talent hit. How to turn that first love into a career? He first worked as as a machinist, programming CNC mills for five years to make ends meet. Then went to college to earn a degree as an engineer. Hoping to satisfy his love of art, he included some classes in Art and Design. As they say, that was the crossroads, and Chad hung a right turn at Albuquerque. He first got into the tattoo scene by designing and selling flash, which he still does, and soon found an apprenticeship with a local shop. Chad’s artistic inspiration came from his good friend, David Boensch, and his tattoo inspirations include, Jon Hunter, DJ Minor, Ben Miller, Jason Stephan, Jesse Smith, and Jime Litwalk. Chad also has the habit of taking to the real Tattoo Highway, and traveling to many shops lucky enough to have him. As a result he has had the privilege of working with many of the tattoo artists that he admires, and hope to get the opportunity to work with many more soon. According to Chad, “My goal is to avoid getting stagnant as an artist. Traveling offers me a way to accomplish that goal and continue to push myself as an artist.” So you can never tell, you just might catch Chad on one of his road trips, or be lucky enough to catch him at H&H. Chad has been featured in Crave Tattoo magazine; August ‘07 vol. 22, and has had his work published twice in International Tattoo, as well as sister publication Tattoo Art magazines. If you want to see more of Chad’s fantastic work check out his online gallery at Chad Stone Tattoos. All Images Property of ChadStone/ChadStoneTattoos.com Copyright 2008. All rights reserved.